The Thello is probably the most iconic European night train after the Orient Express. It’s literally been rolling between Paris and Venice for years, with some of the most beautiful parts of Italy on the route. It’s a great way for dog owners to get to Italy without a long, expensive drive on the toll roads of France, Switzerland and Italy, as travel writer Paul Wojnicki discovered when he hopped aboard with his dog, Falco. You board the train at 19:11 and spend the night in a private compartment with everything you need for a relaxing journey, including bunk beds, wash basin, toiletry pack, bottles of water, power sockets and a space to secure luggage. Just remember to take food with you as dogs aren’t allowed in the restaurant. Here are the highlights of the route along with the arrival/departure times. A city that requires no introduction, from the moment you step out of the train station onto the Grand Canal you’ll be blown away by the sheer majesty of the place the world’s only pedestrian city, where the equivalent of London’s Underground is the Vaporetto water bus. It’s a very dog friendly city, not least because there’s no traffic in the centre! All of the major sights are outdoors and the highlight of any Venice trip is walking around the labyrinthine streets with the ancient baroque architecture, so it’s perfect for dog lovers. Dogs are allowed on the Vaporetto water buses if you (or your dog) are tired of pounding the streets, or you can negotiate with Gondoliers if that’s what floats your boat (pun intended). Criminally under-visited by tourists due to its proximity to Venice, Padova is one of the most beautiful cities in Italy, if not Europe. It’s also a great city for dog owners because many of the main sights are outdoors. For starters, there’s Prato della Valle, the largest square in Europe and certainly one of the most beautiful. The square comprises of a huge grassy area that is encircled by a canal lined with statues of noblemen. The grassed area and the area around the canal are well-used by dog walkers and it takes quite a while to walk around. It's as beautiful a city walk as you’ll find anywhere. Other highlights are the exterior of the Basilica di Sant'Antonio (one of only eight Catholic international shrines in the whole world), a small park containing Roman ruins and Palazzo della Ragione, which at 82 meters long and 27 meters wide has the largest unsupported roof in Europe. The beautiful medieval city in which Shakespeare chose to set Romeo and Juliet has a wealth of dog friendly sights. The 1st century Arena is the third largest surviving Roman amphitheatre (pictured below) in the world and still functions as a live venue today. You can’t enter the arena with a dog but it’s more impressive from the outside anyway. For a great walk that takes in more Roman ruins head across the river and up the hill to Castell San Pietro, here you can enjoy an unrivalled and tranquil view of the city with the medieval towers, churches and castles tucked behind the River Adige and with the ruins of a small Roman theatre just below you. If your dog is the amorous type then head to Casa di Giulietta, or Juliet’s house, afterwards. Supposedly the spot where Shakespeare’s Romeo declared his love to Juliet. It’s something of a cliché, but Falco found the Labrador of his dreams there so maybe there is something in the air after all! It’s not the most beautiful city in Italy by any stretch of the imagination but what Brescia lacks in looks it more than makes up for with its location - just 13 minutes away from Lake Garda (pictured below) by rail - which means you can swim together on one of Italy’s most famous lakes. Trains leave on a regular basis for Desenzano del Garda and Peschiera Del Garda - the latter of which has a dedicated dog beach! Lake Garda isn’t the only lake close to Brescia. If you prefer seclusion then catch the train to Lake Iseo, pictured below, instead (20-30 minutes from Brescia). The lake is one of Italy’s least known northern lakes, which is strange because it’s probably more beautiful than Garda and nestled really close to the Alps. It’s a beautiful spot to swim together and relax in relatively warm water with the mountains towering behind you, and you’re guaranteed to find a stretch of water to yourself, even in the height of summer. The Thello leaves Paris every night at 19:11 and calls at all of the above stations and more. One way fares in a private cabin start at €120 per person. 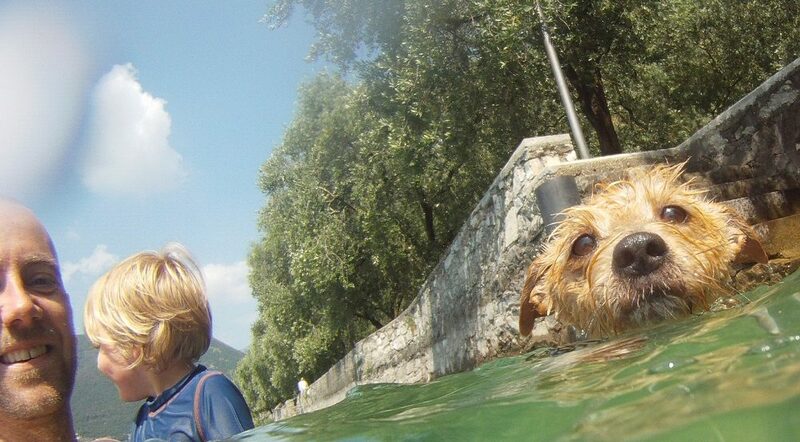 Dogs under 5kg travel free but there’s a €50 surcharge for dogs weighing between 5kg and 50kg. Side trips to Florence or even Rome can be made from Venice, Padova or Verona on the very fast trains that connect these cities.